I was able to try out the new Mario Kart Arcade VR machine that is the first of it’s type outside Japan today at Hollywood Bowl in London’s O2 Arena. Mario Kart Arcade VR is allocated in the arcade part of the bowling area in the VR London Zone Portal alongside Hospital Escape Terror which is another VR game. 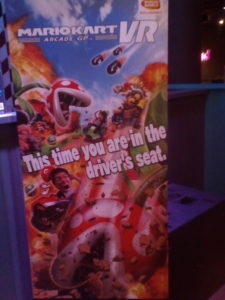 There are 4 actual karts on the podium and each kart has a different character (Mario, Luigi, Princess Peach or Yoshi) and the karts each have a steering wheel alongside brake and accelerate pedals. You are given a HTC Vive headset, headphones and hand graspers with Velcro straps which are used to getting the weapons. Each of these make the player feel like they are actually in the game as opposed to playing it on a screen. There were only 3 weapons to choose from the roster (banana skin, green shell and a hammer) so no blue shelling the leader XD. These weapons are hanging from balloons in which you use the grasper put on your hands to grab them and throw them or bash the hammer at your opponent. 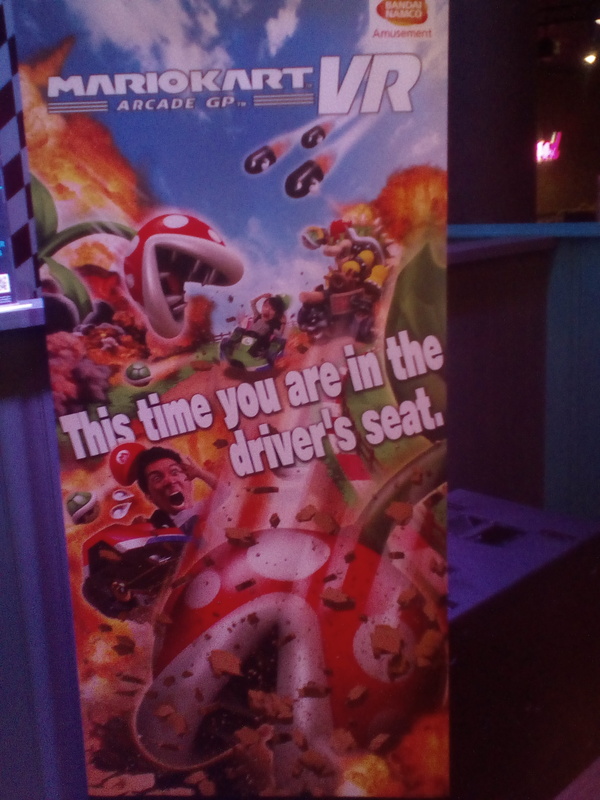 This game takes from the Mario Kart Arcade spinoff as opposed to the main series and this arcade has a Mario Kart Arcade GP cabinet as well so you can make comparisons between the two. At £7.99 per person (or £24.99 for a group of 4) this is more of a occasional experience for many as opposed to being a frequent activity at least for the time being. Also it would have been nice to choose your character on a select screen and have 8 characters at minimum at least. In short, Mario Kart Arcade VR is for a group of players to battle each other but it’s price can be off putting for frequent players.